Michael Edwards works in in oils, acrylics and watercolour. He specialises in capturing light in his paintings. Michael Edwards painting subjects are seascapes, beaches and rivers with light sparkling on the water.He is also known for his sweeping Cotswold landscape paintings, which are often painted in winter colours with bold skies and dramatic lighting. Michael Edwards has produced three books on paintings and is a regular contributor to International Artist and The Leisure Painter Magazine. 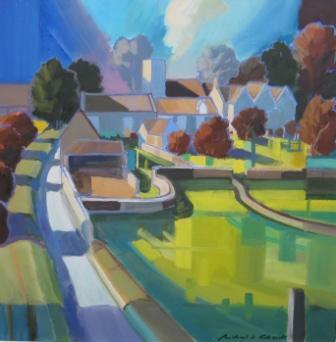 Aswell as Red Rag Gallery in the Cotswolds Michael Edwards paintings have been exhibited in many leading galleries including the Royal Society of Marine Artists and the Royal Institute of Oil Painters. © Copyright 2019 ArtBaloo.com All rights reserved.